We are a surf school with private surf lessons and surf camps for anyone who wants to learn to surf or just have a great time at the beach. 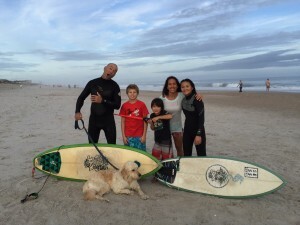 We serve many kids and adults with our surf program and surf clinics at Wrightsville Beach and beyond. Our experience, skill, training and equipment make us simply the best choice for surf schools in the Cape Fear Region or anywhere in the world for that matter. We are a surf club for local kids that want to keep surfing and become more advanced in their skills. Our surf club is an after school program that meets once a week for practice. While this is not a learn to surf program, kids who participate in the club progress from beginner all the way to advanced. Many start to compete in local surf competitions. The after school program is designed for parents who don’t surf or want their kids to be around coaches and other surfers. The cost for this program is much cheaper than our learn to surf programs since participants need fewer instructors and have their own equipment. 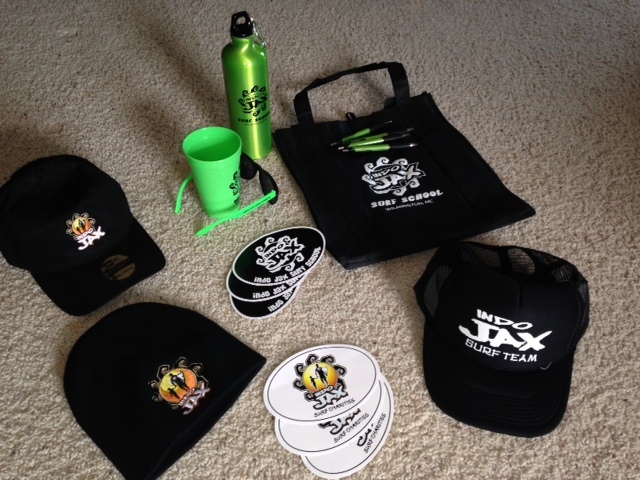 Within the surf club program we have a Team Rider program, The Indo Jax Team. Once you get to this level, you are a competitor, an advanced surfer and working toward being an instructor for our surf school, eventually our surf charity. The Team Riders are our elite surfers, but they have to exude the charitable nature of Indo Jax. They must be of the mindset that they want to share surfing with others and help those that need it. The program we are most proud of is our outreach program. With this program we serve those that are less fortunate than us. We use surfing to empower medically fragile, special needs and at risk youth. Within this program we offer mission trips to other countries such as India and Nicaragua to help children in third world regions. We hold camps for kids that are blind, orphaned, have autism, wounded warriors, children battling cancer, children with hearing impairments, inner city kids, the list goes on. Our outreach program is leading the charge in therapeutic recreation and our program is world renowned. We have been featured in many documentaries, magazines, and newscasts including American Way Magazine, TEDx Talks, etc and we have received many awards for our service to youth in our area and beyond. Indo Jax is many things, but in all that we do we love to help people, have fun in the ocean, and surfing is our tool to do all of it! Indo Jax and the Viorel Family would like to wish you all a Happy New Year! We hope that you had a great 2015, and wish you the very best for 2016. As we move into the 2016 Surf Season, we are stoked on what the future holds for both the Surf School and our Surf Charity. Coming off an incredible season of serving medically fragile, special needs and at risk youth with our Outreach Surf Programs and Charity Surf Camps, we are gearing up for the biggest charity surf season we have ever had. With that being said, we are seeking more sponsorships, more grants and funding, more donors. Indo Jax Surf Charities has one of the biggest and most impressive outreach programs in the Wilmington, Cape Fear NorthCarolina Region. 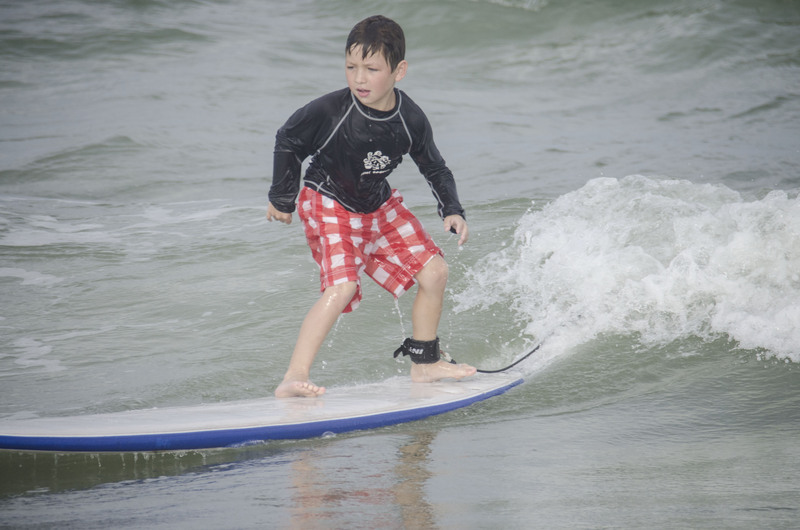 We serve literally more than 1,000 kids a year with our 3-5 day long surf camps. Our camps have been growing rapidly every year and so have our expenses. For those of you who donated in the closing days of 2015, thank you so much! If you’d like to get involved in helping us serve kids who needs this, please give us a call at 910-274-3565 or email me at jack@indojaxsurfschool.com. After an incredible 2014 Summer Surf Season for Indo Jax Surf School and Charities, we decided to hold a Reunion Surf Day on October 4th at our location in Wrightsville Beach NC. It was a roaring success. With perfect ocean conditions, warm air and water and over 60 of our outreach surf camp participants, WE RIPPED! Just about all of our 30+ instructors and another 20 volunteers were on hand, it was a day for the ages. It was also a day we celebrated a new two year partnership with United Health Care and their Do Good, Live Well Program. 2014 has been our best year by far, no doubt about it. Our morning and half day surf camps were maxed out all summer, and our charity surf camps grew to numbers we never thought possible. Our Wrightsville Beach, Topsail Island and Oak Island Programs all expanded. Our goal is, and always has been, to serve as many children as possible, this year exemplified why Indo Jax Surf School and Indo Jax Surf Charities are the premier “Learn to Surf ” Programs in the Cape Fear Region, maybe worldwide. So many great moments from 2014…Sponsorship from the Helen Keller Foundation, 5th Annual Homes of Hope Surf Camp for orphan girls in India, 4th annual Surf Camp for the University of Tennessee Swim Team,, Bound By Sea purchased by a distributor and will be on Net Flix by the holidays, our visually impaired surf camp video made it into Cucalorus Film Festival 2014, receiving the Razor Walker Award and E-Town Awards, revitalizing our Wounded Warrior Program so more wounded vets can participate. It was truly an inspirational and incredible summer. We received so many new Camp Sponsorships that helped us crank out an unbelievable season, sponsorships from Ogden Car Wash, Northstar Group, Trot Nixon and Family, Synergy Medical, Alerttile, George C Foundation, Hope From Helen, Grass Monkey Holdings, First Bank and The Eye Care Center. Our partnerships with Homes of Hope, Surfers Healing, Mauli Ola, Boys and Girls Club, Boys and Girls Home of Waccammaw, and other non profits grew ever stronger. The Wrightsville Beach Wahine Surf Contest was another huge success with over 100 girls participating. We are stoked to head into 2015 and keep all this going! The biggest news of all though, was the new sponsorship from United Health Care. The grant we received from them will ensure we can continue to grow, continue to use the best equipment, continue to hire the best staff, and continue empowering medically fragile, special needs and at risk youth through our amazing surf program. Thank you all for your support in 2014! And it’s not over! The Indo Jax Surf Team program is posting the biggest numbers we’ve ever seen with over 20 kids joining us every Friday to take their surfing to the next level. These kids are ripping, even when it’s big, competing in contests, and volunteering for our charity surf camps and clinics. The Fall Surf Team Program culminates with a trip to Nicaragua. With a full house of 11 surfers and their families, we will be whooping in up at Rancho Santana to experience some exotic waves in warm water this November. 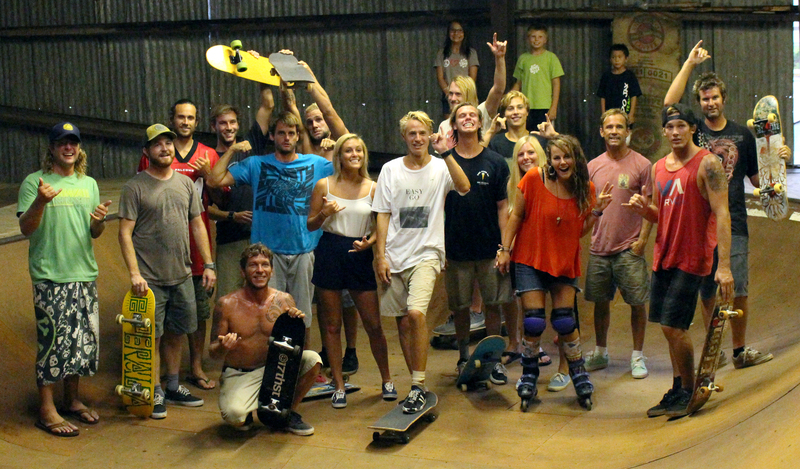 Last Sunday we held our Indo Jax Staff Party at the Skate Barn in Hampstead. We surfed, BBQ’ed and skated all eve, it was awesome! Indo Jax Surf School and Indo Jax Surf Charities has incredible instructors and every year we seem to get better. This year we served more children in both our summer surf camps and charity surf camps than ever before. Our surf instructors go above and beyond all the time, and simply put, are the best you’ll find anywhere. It’s no doubt why our surf camps, surf clinics and surf lessons are always in high demand. At all of our locations in the Cape Fear/Wilmington NC Region, Wrightsville Beach, Oak Island and Topsail Beach our instructors continually provide the highest quality surf instruction money can buy! Here’s to a great 2014! 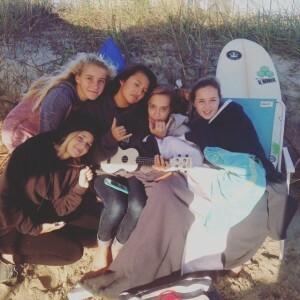 Summer Surf Camps are Open! 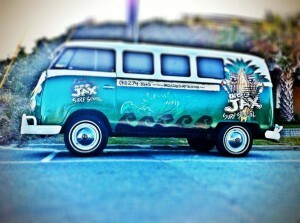 Indo Jax Surf School is open for business! We are currently taking registrations for all of our surf camps, surf clinics, and private surf lessons. We still have availability at all of our locations Wrightsville Beach, Topsail Island, Carolina Beach and Oak Island. Although some weeks are filling, all still currently have available slots. 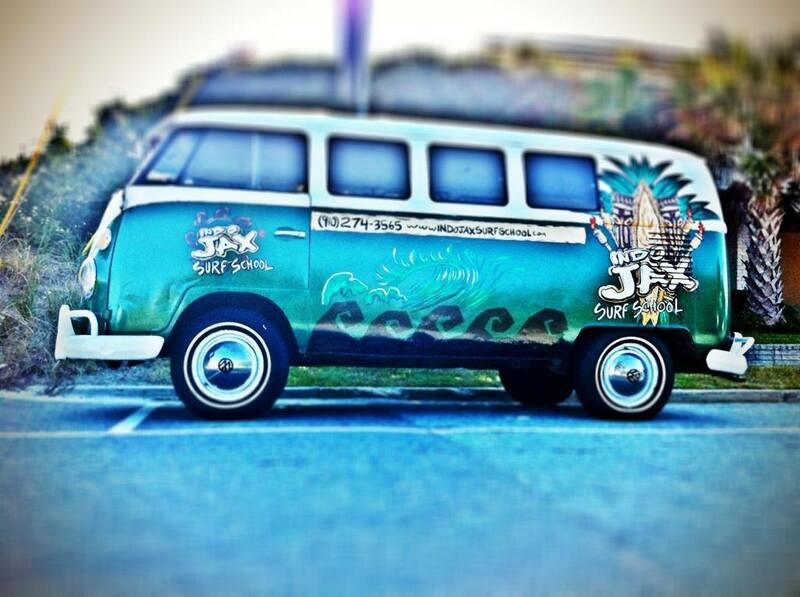 Indo Jax Surf School has the highest quality surf camps and surf lessons money can buy. Our instructors are highly trained, professional and certified, we use the highest performing soft boards on the market which means your child will be safe, and we have a 2-1 student to instructor ratio. Simply put there is no other choice for your “learn to surf” needs than Indo Jax Surf School. 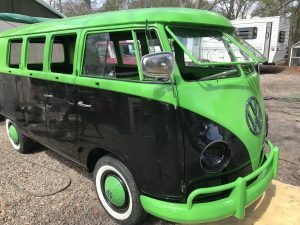 So if you’re in Wilmington NC or anywhere in the Cape Fear Region give us a shout! Feel free to call us at (910)274-3565 or email us at jack@indojaxsurfschool.com to register. Indo Jax Surf School and Charities is stoked and honored to be partnering with The Helen Keller Foundation and Alerttile for the next three years for our Visually Impaired and Hearing Impaired Surf Camps. 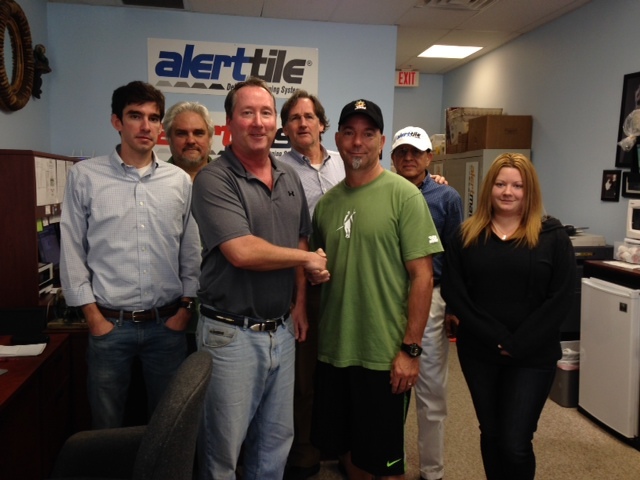 This past week, myself and Alex Munroe (owner of Alerttile) met to sign the deal. 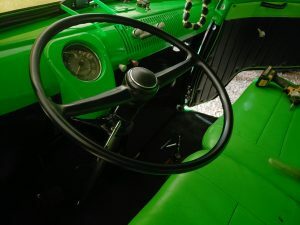 We are so excited about this partnership, as we feel this will greatly increase our ability to serve Visually Impaired and Hearing Impaired children with our outreach surf program. Indo Jax Surf School and Charities has an impressive outreach surf program. We offer FREE surf camps, clinics and lessons to children who are medically fragile, special needs or at-risk. One of our best and most popular programs is our program for children with visual impairments. This is a program we’ve been doing for 6 years and running. It started with 5 children years ago, and has built and grown every year, with last year’s camp hosting some 30+ families. 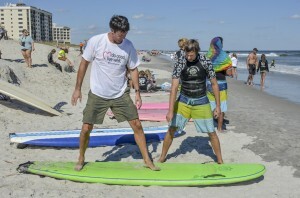 We are incredibly excited and look forward to our 2014 Visually Impaired Surf Camp in Wrightsville Beach NC running July 14-18 from 5-7 pm at Beach Access #10. You can register for this camp on the registration page of our website www.indojax.com.